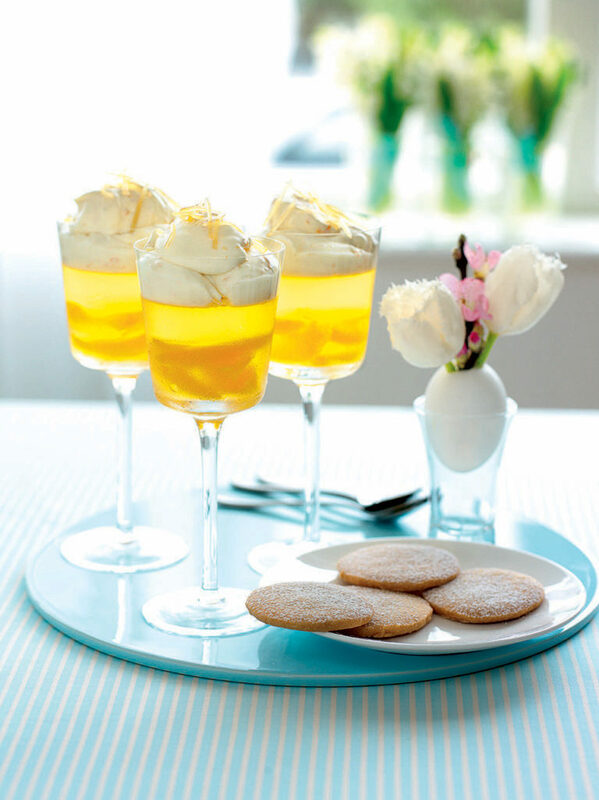 The adult equivalent of a jelly dessert, these orange scented jellies look fantastic served in individual wine glasses topped with creamy ginger syllabub and served with home-made ginger shortbread biscuits. Make the jellies. Finely grate the zest from the oranges and set aside. Cut a thin slice off the top and bottom of each orange, and slice away the skin and pith. Segment the oranges in a bowl, slicing either side of the membrane. Cover and set aside. Put the wine and vanilla pod into a pan and heat gently until almost boiling. Pour into a bowl, stir in the zest and leave for 15 minutes to infuse. Soak the gelatine in a bowl of cold water for 5 minutes. For a clear jelly, strain the wine through a coffee filter or muslin-lined sieve to remove the zest and vanilla seeds (or you can leave these in). Pour back into a cleaned pan and reheat gently. Add the sugar and stir until dissolved. Squeeze out the excess water from the gelatine and add to the hot wine. Remove from the heat and stir until dissolved. Pour into a measuring jug. Divide the orange segments between 6 wine glasses and pour over the jelly. Leave to set in the fridge for 8 hours or overnight. Make the syllabub. Put the cream, orange zest and juice, lemon juice, liqueur, ginger syrup and sugar into a bowl and whisk to soft peaks. Spoon on top of the jellies and chill for 1-2 hours. Sprinkle with stem ginger and serve with ginger shortbread biscuits.